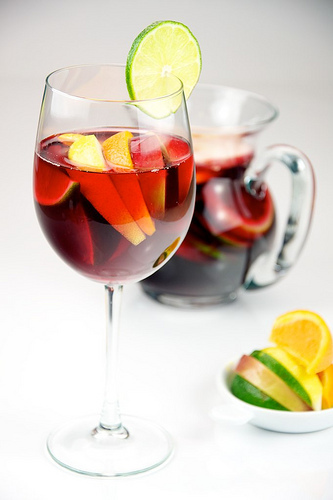 A traditional Spanish punch, sangria is a combination of wine (usually red), liquor (often brandy) and fruit that has been soaking in the mixture over night. While this is definitely a prep-ahead sort of cocktail, it is well worth keeping a pitcher at the ready during those summer heat waves! Floral and fabulous, perfect for beating the summer heat. White wine Sangria with fresh peaches and citrus fruit. Honeydew, watermelon and fresh mint create the ultimate refresher. Simply delicious, combining two quintessential summer flavors: fresh berries and fragrant rosemary. Check out mine! Simple too!